Awards and prizes recognise and reward excellence, and can provide financial support to artists and scientists. Until the mid-20th century contests run by newspapers and magazines were almost the only source of prizes for writers. The Labour government elected in 1935 supported cultural activities. The centennial celebrations in 1940 included prizes for literature. 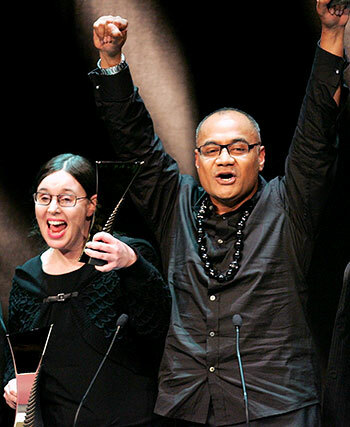 The writers’ organisation PEN NZ established an annual poetry award in 1940 and an annual prose award in 1945. The Esther Glen Award for children’s literature began in 1945. From 1959 the Katherine Mansfield Memorial Award, sponsored by the Bank of New Zealand, was awarded for a short story. The Sir James Wattie Award was set up in 1968. It expanded to become the Goodman Fielder Wattie Awards and then the Montana Book Awards. From 1976 the government presented annual New Zealand Book Awards for fiction, non-fiction and poetry. In the 2010s these were the New Zealand Post Book Awards and covered a wider range of categories. Since 2003 the Prime Minister’s Awards for Literary Achievement have been awarded annually to writers who have made a significant contribution in the genres of non-fiction, poetry and fiction. Fellowships included the Robert Burns Fellowship at Otago University and the Katherine Mansfield Menton Fellowship, which allows a writer to live in Menton, France. Awards were introduced for other arts from the late 1950s. From 1956 to 1970 the Kelliher Art Prize was awarded for a realistic landscape painting. The annual Wallace Art Awards began in 1992 and continued in 2014. The Mobil Song Quest began in 1956. People went to their local radio station and were broadcast singing. The competition later focused on opera. The first awards for recorded music were the Loxene Golden Disc Awards, from 1965. The National TV Awards were held in 1965 and 1966 to promote training. From 1970 to 1985 the New Zealand Feltex Awards covered film and television. The annual Qantas Press Awards began in 1974. In the 2010s they were the Canon Media Awards. The New Zealand Radio Awards were first held in 1978. The Royal Society of New Zealand administers a range of funds, medals and awards for science. The Prime Minister’s Science Prizes have been awarded since 2009. From 1948 Fulbright fellowships have allowed New Zealanders to study or teach in the US. Since 1997 the Artists to Antarctica Programme has sponsored artists to visit and work in Antarctica. New Zealanders have also won international awards. Writers Keri Hulme (1985) and Eleanor Catton (2013) won the prestigious Booker Prize for fiction. Scientists Ernest Rutherford (1908), Maurice Wilkins (1962) and Alan MacDiarmid (2000) received Nobel prizes.